By Aoife Mulford | October 19, 2010. 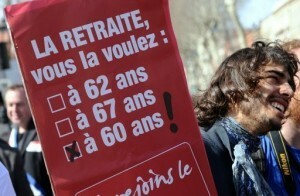 French president Nicolas Sarkozy faces more disruption and protest as unions hold another round of nationwide strikes in an attempt to increase the pressure on the French president, and force out his proposed plans to raise the pension age to 62. Sarkozy was forced to open a government crisis centre on 18 October as the violent street clashes over pension reforms caused a major fuel shortage in the country. Rolling strikes over Mr Sarkozy’s plans halted supplies from all but one of the country’s 12 oil refineries and panic-buying caused a 50 per cent jump in petrol sales. The strikes have severely affected air traffic as air traffic controllers walked out in conjunction with the protests. The fuel shortage has affected both outgoing and incoming flights. Both Ryanair and Aer Lingus cancelled a number of flights to France. Sakozy came to power in 2007 after promising a number of popular reforms during his election campaign. The French President failed to implement a large portion of his reforms and he is now refusing to back down on this controversial pension reform. Amid signs of union divisions, there was optimism in government that the protests would soon wind down, but after six weeks of strike actions, it seems tensions are still high.